F Aaron Gagnon (Seattle, 2001-07) has signed a one-year contract with Langnau (Switzerland, NL A). This season, with Lukko Rauma (Finland, Liiga), he had 11 goals and 15 assists in 43 games. He also played seven games with Bern (Switzerland, NL A), scoring three times and adding two assists. . . .
F Brandon Segal (Calgary, 1999-2004) has signed a one-year extension with the Nuremberg Ice Tigers (Germany, DEL). This season, he had 16 goals and 16 assists in 52 games. Zach Sawchenko, one of the WHL’s premier goaltenders, revealed on Tuesday that he won’t be returning to the Moose Jaw Warriors for his 20-year-old season. Instead, he will be attending the U of Alberta and playing for the Golden Bears. It seems the insecurity inherent with a professional career doesn’t appeal to Sawchenko, at least not without a backup plan. This season, Sawchenko went 30-14-7, 2.79, .917 in the regular season. He was selected as the Eastern Conference’s top goaltender and named to the conference’s first all-star team, the latter for a second straight season. A native of Calgary, Sawchenko played four seasons in Moose Jaw, going 88-65-16, 3.11, .908 in 177 games. The 6-foot-1, 185-pounder never was selected in the NHL draft. He went into the 2016 draft ranked by NHL Central Scouting as No. 6 among North American goaltenders. The Warriors selected Sawchenko in the second round of the WHL’s 2012 bantam draft. The Warriors’ depth chart now will show Brody Willms as the organization’s No. 1 goaltender, with Adam Evanoff sliding into the No. 2 spot. 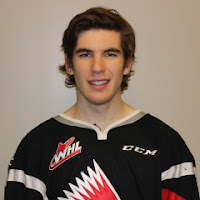 Willms, who turns 19 on July 21, is from Coquitlam, B.C. He was an eighth-round selection in the 2013 bantam draft. This season, he got into 25 games, going 12-7-2, 3.11, .907. Evanoff is from Penticton, B.C., and was a 10th-round selection in the 2015 bantam draft. He will turn 17 on Aug. 16. He played this season at the Okanagan Hockey Academy in Penticton, going 2.44, .918 in 19 appearances. Smith’s story is right here. The Victoria Royals have signed F Tyus Gent, who was a fourth-round selection in the WHL’s 2016 bantam draft. Gent, 16, is from Delta, B.C. He played this season with the Delta Hockey Academy’s Elite 15s of the Canadian Sports School Hockey League, putting up 25 goals and 25 assists in 25 games. He led the Elite 15s in goals and points, and was saluted as the MVP at season’s end. . . . He also got into eight games with the academy’s prep team, scoring twice and adding an assist. F Judd Caulfield, a highly touted prospect out of the North Dakota high school ranks, has decided to join the U.S. National Team Development Program, according to Brad Schlossman of the Grand Forks Herald. . . . Caulfield, 16, will be part of the U-17 program. . . . Caulfield, whose WHL rights belong to the Portland Winterhawks, put up 64 points, including 25 goals, in 27 games this season with Grand Forks Central, which won the state championship to conclude an undefeated season. . . . Caulfield was selected by Portland in the 10th round of the 2016 WHL bantam draft. 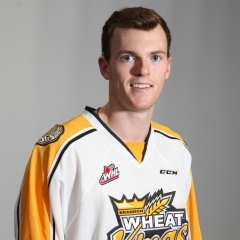 He committed to the U of North Dakota on Oct. 5.
victory over the host Chilliwack Chiefs in Game 7 of the championship final. . . . Campbell, 20, is from Brandon and spent the previous two seasons playing for the Wheat Kings. He joined the Vees early this season and put up 28 points, including 11 goals, in 40 games. . . . Three of the last four games in the BCHL final were decided in OT. . . . Both teams advanced to the Western Canada Cup that runs in Penticton from April 29 through May 7. It also features the AJHL-champion Brooks Bandits, SJHL-champion Battlefords North Stars and MJHL-champion Portage Terriers. . . . Interestingly, F Keegan Kolesar, whose two goals helped the Seattle Thunderbirds to a 2-1 victory over the Rockets in Kelowna last night, also was born in Brandon. The NHL’s Vancouver Canucks will introduce Travis Green, a former WHL player and coach, as their new head coach at a news conference today. . . . Green, 46, is from Castlegar, B.C. He played four seasons (1986-90) in the WHL, three-plus with the Spokane Chiefs and the last 25 with the Medicine Hat Tigers before going on to a pro career that included 970 NHL games. As a coach, he spent three seasons (2010-13) on the Portland Winterhawks’ staff. For the past four seasons, Green has been the head coach of the Utica Comets, the Canucks’ AHL affiliate. . . . In Vancouver, he replaces Willie Desjardins, who was relieved of his duties when their season ended. . . . You can look for Green to bring along Nolan Baumgartner, a former WHL defenceman, as his lead assistant coach. Baumgartner, 41, has been an assistant through all four seasons with Green in Utica. Baumgartner played four seasons (1992-96) with the Kamloops Blazers and was twice named the WHL’s top defenceman. The junior B Port Moody Panthers of the Pacific Junior Hockey League have hired David McLellan as their head coach. He replaces Mike Renner, who was dropped on March 29. . . . McLellan has PJHL experience, having worked as head coach of the Delta IceHawks (2010-13), where he won a league championship in 2012. Most recently, he was the GM/head coach with the junior B Nelson Leafs of the Kootenay International Junior Hockey League. He also has coached in the BCHL, B.C. Intercollegiate Hockey League and in Japan. Jeff Brown resigned Tuesday as the general manager and head coach of the OHL’s Ottawa 67’s. He cited personal reasons in leaving after three seasons. . . . He served as head coach for three seasons and GM for the past two. . . . “The move back to Ottawa has been difficult at times for my family,” Brown said in a news release, “and it’s time I put them first and became a full-time father as we transition back to our hometown of St. Louis.” . . . That news release is right here. The Chicago Blackhawks have fired Ted Dent, who was the head coach of their AHL affiliate, the Rockford IceHogs. Dent had been with Rockford through six seasons, going 221-179-54. Before taking over as head coach, he had been an assistant with the Blackhawks’ AHL team, either in Rockford or Norfolk, for five seasons. Best site of the night, I saw and got to visit Parry Shockey at tonight's game between the #Pats and #Hurricanes. Getting his second of the night with :20 left in the game, Keegan Kolesar has now scored 5 of the @SeattleTbirds last 13 goals. Conference final, 2-1, with Game 4 in Kelowna tonight. . . . The Thunderbirds won the opener, 5-4, on a PP goal by D Ethan Bear with 12 seconds left in the third period. The Rockets won Game 2, 4-3 in OT. . . . Last night, the winner came off a faceoff in Kelowna’s, with F Mathew Barzal getting the puck back to D Turner Ottenbreit. 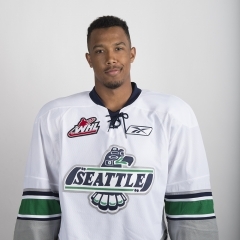 His shot didn’t get through to the net, but the puck went to Kolesar who snapped a shot from the slot that beat G Michael Herringer through traffic. . . . Kolesar, who has nine goals, gave Seattle a 1-0 lead at 11:33 of the second period. . . . The Rockets tied it on a PP at 13:53 when F Calvin Thurkauf (7) scored a goal that was confirmed after a lengthy video review. A shot by F Nick Merkley went off the end boards and rebounded over the Seattle net, where Thurkauf batted it past G Carl Stankowski. . . . “They said that it was right at the cross bar,” Seattle head coach Steve Konowalchuk told Andy Eide of 710 ESPN Seattle. “It seems in the three games, we’re not getting any calls. Two goals last game, there were plays on the goals that could have been called and we’re just not getting the calls right now. We have to persevere and control what we can control.” . . . Kelowna was 1-7 on the PP; Seattle was 0-1. The Thunderbirds enjoyed the game’s first PP opportunity, then watched the Rockets get the last seven. . . . The Rockets have at least one PP goal in eight straight games. . . . Stankowski finished with 34 saves and was the game’s first star as he continued to weave his playoff magic. He is 10-1 in the playoffs since replacing injured starter Rylan Toth, who has yet to dress for a game. . . . Herringer finished with 12 saves. . . . Seattle had four shots on goal in each of the first and third periods. . . . Kelowna F Reid Gardiner, who leads the playoffs in goals (15) and points (27), had his point streak snapped at nine games. Gardiner had put up eight straight multi-point games, getting 24 points over that stretch. . . . Seattle F Donovan Neuls had his point streak end at 10 games, the longest in the playoffs this season. . . . Announced attendance: 5,085. . . . Eide’s story is right here. . . . Larry Fisher of the Kelowna Daily Courier has a game story right here. host to Game 4 tonight. . . . Joseph, who has two goals in these playoffs, took a slashing minor at 11:46 of the second period. He stepped out of the penalty box and went in to score the go-ahead goal at 13:54. . . . Joseph, a freshman from Sherwood Park, Alta., had three goals in 68 regular-season games. . . . D Brennan Menell (5) had given the Hurricanes a 1-0 lead just 16 seconds into the first period. . . . Regina tied it when F Dawson Leedahl (9) scored at 10:43 of the second period. . . . 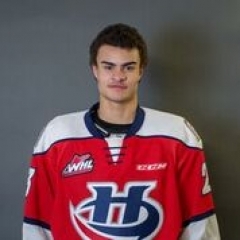 The Hurricanes got some insurance from F Egor Babenko (8), at 4:08 of the third period. . . . D Brady Poteau and F Tyler Wong each had two assists for Lethbridge. . . . The Hurricanes got 28 stops from G Stuart Skinner, who won his 10th game of the playoffs. . . . G Tyler Brown blocked 24 shots for Regina. . . . Each team was 0-3 on the PP. . . . The Pats received the game’s first three PP opportunities but weren’t able to score. That may well have been a turning point. Regina’s PP is 0-9 in the series. It was No. 1 (31.5 per cent) in the regular season. . . . Regina F Austin Wagner left the game in the second period and didn’t return. He has 12 goals and two assists in 14 games. . . . The Hurricanes remain without F Matt Alfaro, 20. . . . Announced attendance: 5,178. . . . Darren Steinke, the Travellin’ Blogger, is in Lethbridge and his Game 3 post is right here. . . . Greg Harder of the Regina Leader-Post has a game story right here.